This Solutrean biface was found during excavation in the early 1900's in a rock shelter called Le Ruth. This site is located on the Vezere River in southwestern France. It is also situated near the famous Mousterian site of Le Moustier. This point was found broken in two pieces and the surface is heavily patinated. This "Laurel Leaf" point measures 5 7/8 inches (13cm) long, 2 1/8 inch (5.4cm) wide and 3/8 inch (.9cm) thick. This bifacial point was found several years ago in a rock shelter called Le Ruth on the Vezere River in southwestern France. It dates to somewhere between 22,000 to 18,000 years ago. 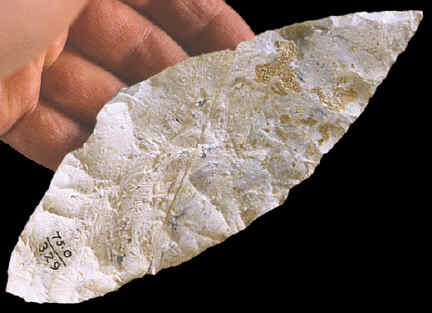 The Solutrean stone tool assemblage is most famous for the first truly thin bifaces made by highly skilled flintknappers. Their flintknapping tool kit would have been fully developed by this time. It would have been equipped with hard and soft percussion flaking tools to drive off larger reduction flakes and smaller pressure flaking tools for removing the smaller last stage finishing flakes and resharpening flakes. This Laurel Leaf point was probably used as a knife. It measures 5 13/16 inches (14.8cm) long. By Jim G. Shaffer PhD. Ovoid in shape and cross-section this Solutrean Biface was made from a large flake. Extensive bifacial retouching has removed all traces of the original flake such as the bulb of percussion and striking platform. Retouching was accomplished with a soft hammer, however, the shallowness of some scars suggest that pressure flaking was also used to produce the final form and to thin the tool. Bifacial utilization scars can be found around the entire tool’s perimeter but have their highest frequency on the two edges which converge into the point opposite the museum number. The long edge left of the museum number has a purposefully formed notch with a smoothed concave edge. Its location near one end and the smoothing suggests that the notch may have been used in hafting perhaps as a locus for wrapping cordage to secure the tool and handle. However, this tool could have been partially wrapped with a piece of skin and hand-held. 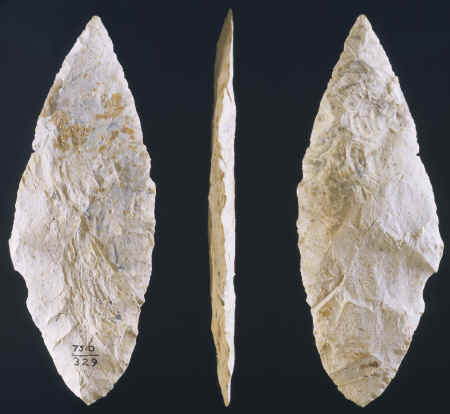 The high frequency of bifacial utilization scars on the edges near the most pointed end, the one farthest from the notch, suggests the primary function was that of a knife. Although this point could have been hafted to a long handle its thinness might have made it to brittle for use as a spear. This artifact reflects the activity of a highly skilled knapper and is an excellent example of the very distinctive "laurel-leaf" type point associated with Solutrean industries. Le Ruth is a rock shelter on the Vezere River in southwestern France, and is located near the famous site of Le Moustier. Excavated in the early 20th century by Peyrony this site had five meters of deposits. Culturally these deposits contained artifacts attributed to the Aurignacian, Solutrean and early Magdalenian industries indicating the site was repeatedly occupied between ca. 25,000 to 13,000 B.C. The research at Le Ruth helped establish the basic stratigraphic relationships between these industries especially since sterile deposits were found separating Aurignacian and Solutrean as well as Solutrean and Magdalenian deposits. It was also one of the earliest excavated sites where early, middle and late aspects of the Solutrean industry were defined. 1988, Tattersall, Ian, Delson, Eric, Couvering, John Van, "Encyclopedia of Human Evolution and Prehistory," "Solutrean," pages 532 and 533. Personal Communication with Jim G. Shaffer PhD., Case Western Reserve.